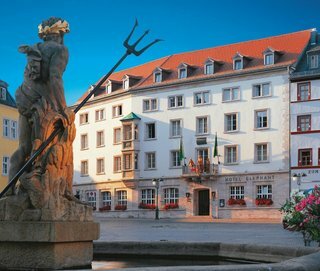 The Hotel Elephant Weimar in the heart of the classic city is one of Germany's most historic and renowned hotels. Looking back on a long tradition the hotel is operated by arcona Hotels & Resorts and reopened in October 2018 as Autograph Collection hotel after extensive renovation. Under this brand, Marriott unites exceptional, hand-picked hotels with a unique perspective in design, craftsmanship and hospitality under the premise of "exactly like nothing else". The unique charm of the future boutique hotel is characterized by timelessly elegant design as well as classic Art Deco and Bauhaus elements, which are reflected in 99 comfortable rooms and suites, meeting rooms and public areas. Cultural topics and culinary art are in the focus of attention, as well as an in-house cultural expert opening the treasures of Weimar to guests in the house and on private city tours. One of them is the Hotel Elephant itself: for over three centuries it has been the hub of the city's social life.